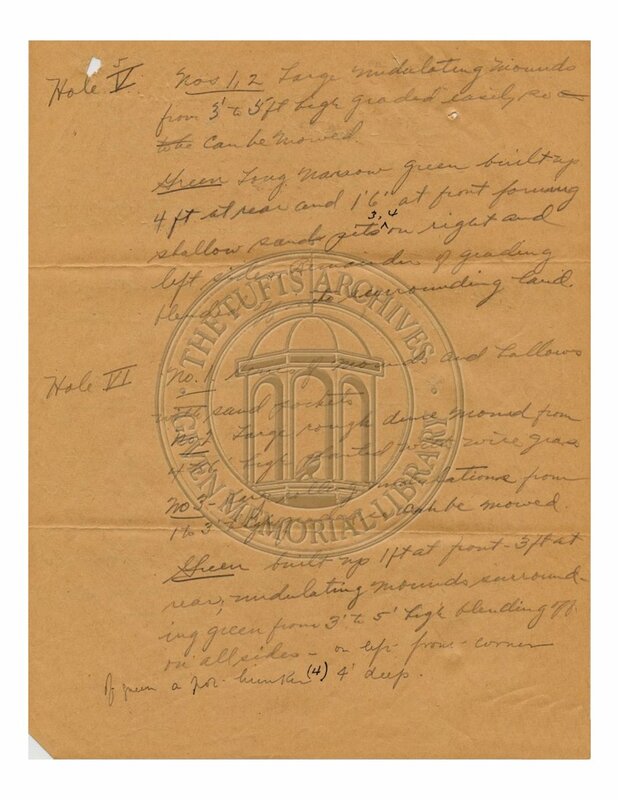 Thanks to the efforts and generosity of the Donald Ross Society, the Tufts Archives at Given Memorial Library in Pinehurst, North Carolina, and our Friends and supporters, we bring to Sarasota and to you Donald Ross's original hand-written Field Notes. These are the personal notes and specifications that Ross himself authored following his time on the Sarasota sawgrass land that he would transform into Bobby Jones Golf Club. With, keyed to and inseparable from his own master Plan of the golf course, Ross's notes provide the most detailed description and authentic instructions available for construction of each of Donald Ross's masterful design concepts, for what resulted in a true masterwork. Read and enjoy for yourself Donald Ross's observations, emphasis and strategy, in his own hand. Travel in time to 1925 and follow Ross's thinking in the creation of a championship golf course, and understand the masterful original Ross design, regarded throughout its earlier decades as among the finest in the South. Compare for yourself Ross's proven vision to what we experience today: the result and evidence of recent decades of departures from Ross's master plan through unrelated maintenance programs and periodic reactive "renovations", without adherence to the original Donald Ross plan or reference to (or even acknowledgement of) Ross's actual Field Notes. Now, you have access here to both Ross's Plan and to his Field Notes. Imagine The Donald Ross Course at Bobby Jones Golf Club restored to Ross's intentions, as Donald Ross himself envisioned and built it and as Bobby Jones himself played it, and there for you yourself to play today, walking in the footsteps of the legends of the game. This is the same mind and hand that brought forth Pinehurst No. 2, Oak Hill, Oakland Hills and Seminole. Donald Ross provided the design for Bobby Jones's youth at East Lake in Atlanta, and that nurtured Jack Nicklaus at Scioto in Columbus, Ohio. Ross gave us Inverness Club, the scene of Bobby Jones's first United States Open and of Paul Azinger's PGA Championship victory. Donald Ross courses would host two-hundred-thirty-four Major Championships, and counting. The cumulative total of major championship venues created by all FIVE of the golf course architects (Harris, Anderson, Marshall, Garl, Mandell) that have conceived additions and renovations to Bobby Jones Golf Club since the original Donald Ross design is zero (and counting). Donald J. Ross, Golf Architect, provided essentially the same Plan and Field Notes process to conceive and direct the construction of each of his masterworks. For Bobby Jones Golf Club, we have these same tools, from the same design team, and already paid for by the City of Sarasota in 1925 dollars, available to us for use today. Imagine your children and grandchildren, and theirs, learning the game on a Donald Ross Course, as Bobby and Jack and Zinger did, understanding and employing Ross's emphasis on strategy, course management, the approach and the short game. The historic Donald Ross Course at Bobby Jones Golf Club is what attracted Bobby Jones, Walter Hagen, Jock Hutchison, Byron Nelson, Gene Sarazen, Sam Snead, Patty Berg, Betty Jameson, Betsy Rawls, Louise Suggs, Mickey Wright and Babe Zaharias, among a total of more than twenty World Golf Hall of Fame members to Sarasota to play our course. Of course, Donald Ross himself was the first, and for many years the only, golf architect to be inducted into the World Golf Hall of Fame. The historic Donald Ross Course at Bobby Jones Golf Club is what attracted the PGA and the LPGA to choose Bobby Jones Golf Club for regular Tour events and ultimately, why the PGA of America twice selected The Donald Ross Course at Bobby Jones Golf Club as the venue for Major Championships: the 1940 and 1941 Senior PGA Championship, the oldest and most storied of the five senior major championships, following its premier at Bobby Jones's Augusta National Golf Club. Donald J. Ross traveled the country extensively, project to project, creating masterwork upon masterwork, following a detailed train schedule and communicating constantly to his offices by telegram and letter, sometimes on borrowed stationary from hotels and businesses encountered in his travels. The Field Notes are included in a 1925 letter Ross wrote to one of his most trusted associates, Walter Irving Johnson, Jr., a licensed professional civil engineer Ross hired in the fall of 1920. "Irving" lived in Newton Centre, Massachusetts, walking distance from Ross's home and office at 1032 Centre Street. Johnson was Ross's right-hand man, following Ross as the master architect made residence in Newton Centre, then Little Compton, Rhode Island and each winter at Pinehurst, North Carolina. The Sarasota "Municipal Golf Course and Recreation Grounds" Plan is dated "1925" and identified as "Drawn by W. I. Johnson Jr Pinehurst". 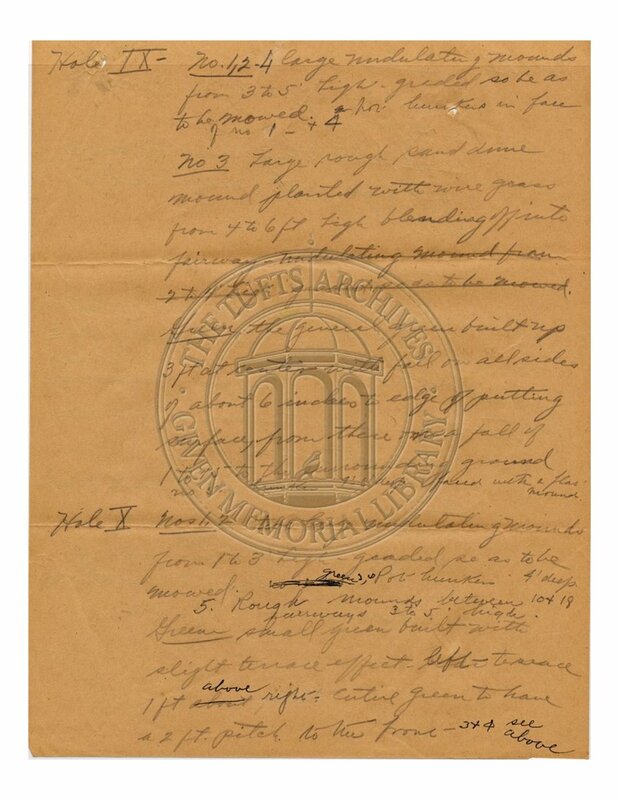 This provides the telling clue that the original plan for Bobby Jones Golf Club was most likely created sometime in January, February or March of 1925. In this letter, Ross shares observations and directives from a design visit to the Sarasota site that would become Bobby Jones Golf Club, and discusses contract deliverables, General Specifications and Field Notes to guide the construction of the golf course. Most importantly, Ross provided very detailed hole-by-hole descriptions of each of the features, from tee to green, that make each golf hole unique and a uniquely Donald Ross masterwork. Many of Ross's masterful features have been lost over time. Along with the Ross Plan, these notes allow builders, in 1925 as well as today, to accurately construct each and every Ross design element that provide one of the most enjoyable and interesting experiences in the game of golf: the challenge, strategy and fun of navigating an original Donald Ross golf course. "Mac" refers to Ross's collaborator since 1916, J. B. McGovern. McGovern, working from the Wynnewood, Pennsylvania satellite office, would become with Ross one of the thirteen charter members of the American Society of Golf Course Architects at it's first annual meeting in Pinehurst in December 1947. Louis G. Lancaster was son-in-law of circus magnate Charles Ringling, future City of Sarasota Commissioner and Chairman of the County Board of Commissioners as well as Florida State Representative. As President of the Ringling Bank & Trust Company in Sarasota, a leading local amateur golfer, President of the West Coast Golf League, chairman of the golf committee, Lancaster was the driving force behind the establishment of the Sarasota Municipal Golf Course and Recreation Grounds, now Bobby Jones Golf Club, after the closing of the John Hamilton Gillespie designed Sarasota Golf Club on June 1, 2016. Four days later, the new Donald Ross designed municipal course opened. Three days after that, Lancaster won the primary for candidates for the Board of County Commissioners. Lancaster would famously be paired with Robert Tyre "Bobby" Jones, Jr. in the Bobby Jones Golf Club dedication exhibition match on February 13, 1927. They played against Sarasota leading amateur Jim Senter and longtime Jones Atlanta friend Watts Gunn. Gunn was recently runner-up to Jones in the 1925 United States Amateur Championship, in the only U. S. Amateur final played between members from the same golf club, East Lake Country Club. In the Bobby Jones Golf Club dedication exhibition match, Jones shot 73 and Lancaster 77 to best Watts's 75 and Senter's 83. Donald Ross reveals in the first page of this letter a detail that could be incredibly significant toward completing the historical record of Bobby Jones Golf Club, and an invaluable resource toward the most accurate restoration of The Donald Ross Course at Bobby Jones Golf Club today: the reference to "enlarged greens plans required" to be sent by the Ross firm to Mr. Lancaster at the Ringling Bank office. What this note indicates is the likely existence of a set of larger-scale plans of each individual green complex, providing a much more intimate and accurate depiction of the Ross design intent than that shown in the master Plan. Golf historians know that the general practice of the Ross office was the creation of several levels of documentation for each golf course design: the 1" = 100' scale master Plan that we have as a resource today, courtesy of the Tufts Archives depository of Ross documents in Pinehurst, North Carolina; a single plan on separate sheets of each hole; cross-sections of each hole indicating elevation changes, slopes and ridges; and a set of eighteen individual Enlarged Greens Plans showing each putting surface with surrounding sand traps, mounds and detailed features, such as those Ross references in his letter to Johnson. For the Sarasota Municipal project, it appears that Donald J. Ross, Golf Architect was contracted to provide the master Plan and the enlarged greens plans and Specifications, but not the individual hole plans. In many cases, Johnson prepared up to five sets of each document, for the Ross office, for the course owner, for the contractor, for the course superintendent, and for the golf club. We believe that Ross's forces built the Sarasota Municipal golf course, and we know that the City both owned and operated the course. It is possible, and even likely, that Ross drawings for Sarasota Municipal Golf Course and Recreation Grounds were distributed to Louis Lancaster, to Mayor (1921-1931) Everett J. Bacon, and perhaps to the first golf course manager, Everett Johnston. Thus, Ross's original "enlarged greens plans" might be found in the business or personal records, estates or archives of Mr. Everett Joseph Bacon, Mr. Everett Johnston, Mr. Louis Lancaster, Mr. Walter Irving Johnson, Jr., Mr. J. B. McGovern, Mr. Donald J. Ross, Ringling Bank & Trust Company, Bacon's Real Estate and Insurance company offices, Bacon's business partner Mr. J. M. Clark, the City of Sarasota, Bobby Jones Golf Club, and the office of Donald J. Ross, Golf Architect. In that Mayor Bacon also served as Justice of the Peace, his official records of that office may have included peripheral documentation such as the golf course contract documents. Thus the search, and the path toward the restoration of this historic Donald Ross masterwork, continues. Winning 2008 Ryder Cup Captain and Major champion Paul Azinger photograph courtesy of the PGA of America. FRIENDS OF BOBBY JONES GOLF CLUB, INC. I HAVE FOLLOWED THE POSITIVE EFFORTS of Friends of Bobby Jones Golf Club TO BRING THE SIGNIFICANT HISTORY AND POTENTIAL OF BOBBY JONES GOLF CLUB AND THE RENEWED INVESTMENT IT DESERVES TO THE ATTENTION OF THE COMMUNITY. SINCE MY FIRST LETTER TO YOU IN JANUARY 2014 AND INCLUDING MY APPEARANCE TO THE CITY COMMISSION IN SEPTEMBER OF LAST YEAR, I HAVE CONTINUED TO VOICE MY SUPPORT FOR AND ENDORSE THE NEEDED CHANGES AT BOBBY JONES GOLF CLUB. IT WAS GREAT TO HEAR THAT THE BOBBY JONES GOLF CLUB STUDY COMMITTEE PROVIDED A STRONG MAJORITY STATEMENT IN SUPPORT OF INVESTMENT IN THE FACILITY CONSISTENT WITH THE FOUR INITIATIVES OF FOBJGC (INCLUDING THE HISTORIC RESTORATION OF THE DONALD ROSS COURSE). COURSE DESIGNER OF THE "AZINGER COURSE"
THANK YOU FOR TAKING THE TIME TO GO OVER THE FOUR INITIATIVES OF FRIENDS OF BOBBY JONES GOLF CLUB AND SPECIFICALLY THE AZINGER INITIATIVE. I HAVE FOND MEMORIES OF LEARNING THE GAME AT BOBBY JONES GOLF CLUB. MY TIME AND PRACTICE THERE HELPED ME TO BECOME THE TYPE OF PLAYER I NEEDED TO BE IN ORDER TO FIND SUCCESS ON THE PGA TOUR. I SINCERELY HOPE THE CITY OF SARASOTA ALSO SEES THE MERITS OF THESE INITIATIVES AND WHAT THEY WOULD MEAN FOR THE CITY, ITS RESIDENTS AND TOURISTS. I CANNOT WAIT TO BE INVOLVED IN LEAVING A POSITIVE LEGACY FOR THE COURSE THAT MEANT SO MUCH TO ME GROWING UP. THANK YOU FOR YOUR TIRELESS EFFORTS AND I LOOK FORWARD TO BEGINNING THIS JOURNEY WITH FRIENDS OF BOBBY JONES GOLF CLUB. On Tuesday, January 28, 2014, the City of Sarasota hosted an Open House at Bobby Jones Golf Club, inviting the public to come together to share a vision for the future of Bobby Jones Golf Club. At this meeting, Friends of Bobby Jones Golf Club was also invited to share in this public forum, offering more insight into the Four Initiatives, including the Azinger Initiative, as well as our Values Initiatives. We listened closely to the great ideas offered by individuals at the meeting, helped to answer a number of insightful questions, and will continue to incorporate the ideas shared that evening into our ongoing conversations. Paul Azinger offered to show his support through his letter to us on that date, and suggested that we share it with you.